As you may know, this past year the LITH Gala committee added a toy drive to the event, in support of local families impacted by Hurricane Harvey. Everyone attending the sold out gala brought a toy. The toys collected were contributed to the Houston Fire Department’s Operation Stocking Stuffer. Further, event sponsor Big Blue Whale Toys & Curiosities on 19th street bested their original offer to match every toy purchased there by people attending the gala, more than doubling-up on the good cheer! Late in January we received a summary of the results of Operation Stocking Stuffer in 2017. Over forty pages long, it documents everything that went into producing the biggest and most successful toy drive in their history. 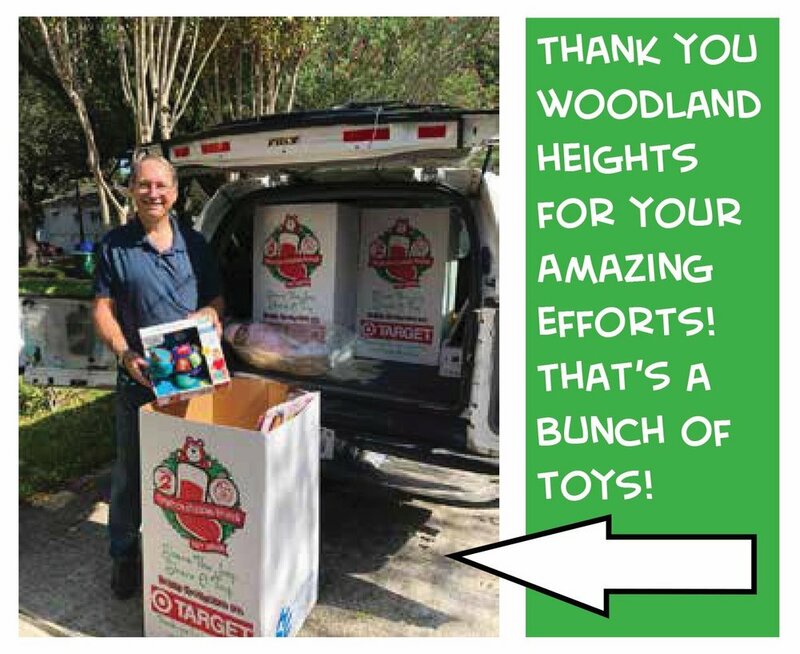 It includes a specific call-out to the Woodland Heights for the truckload of toys donated as a result of the LITH Gala. By now you know that this year's Lights-in-the-Heights Gala features a toy drive. We've partnered with the City of Houston Fire Department's Operation Stocking Stuffer to collect toys for families in need across Houston. The LITH Gala & Toy Drive is presented by Boulevard Realty, on November 4th, at the fabulous new Elan Heights building at 825 Usener. Tickets to the Gala are just $75 and an new unwrapped toy. Your support of the Gala sustains Lights-in-the-Heights, the cities' premier holiday festival, and helps put smiles on children's faces all across the city. Want to do even more good? Big Blue Whale Toys & Curiosities on 19th street have offered to match any toys purchased for contribution to the Gala. Visit their shop and choose from their excellent selection of toys and games. Tell them that you're buying them for the LITH Gala and they'll match your purchase! That's two smiles for the price of one! It's a chance to do twice a much good. In these extraordinary times of Houston’s recovery, Woodland Heights Civic Association hopes to promote the strength of Houstonians and help get everyone’s life back to normal. Therefore the Lights-in-the-Heights Gala, the event that funds Lights-in-the-Heights, will still go on! Mindful of the devastation thousands of Houstonians have suffered, we had reservations about diverting fundraising dollars away from Hurricane Relief. So, the LITH Gala will be abbreviated, this year. Gala tickets have been reduced to $75, and all who attend are asked to bring a new, unwrapped toy. Toys collected will be distributed to families in need through the City of Houston Fire Department’s “Operation: Stocking Stuffer”. Hoping to reduce the burden on already stressed businesses, we are eliminating the raffle and silent auction, and limiting our requests for in-kind donations. The Gala and Toy Drive is presented by Boulevard Realty. We are deeply grateful for their continued support. Other returning sponsors will include Sonoma Wine Bar & Restaurant, Kagan Cellars, Eureka Heights Brewing Co, and Pennebaker, Inc. All of our sponsors are more than just monetary or in-kind donors; each has shown genuine love for our community. We are profoundly thankful for their support. Tickets can be purchased in the store at the Woodland Heights web site. The LITH Committee is already hard at work on the 30th annual Lights-in-the-Heights, which begins with a fund raising Gala on Saturday, November, 4th at Elan Heights. The Lights in the Heights Gala was held on Saturday, 11/19/16, at the new Elan Heights Apartment Building. This is our primary fundraiser for Lights in the Heights, and we raised $12,000+ this year through ticket sales, silent auction, and raffle. Elan Heights was wonderful in opening their doors and welcoming us to their beautiful game room overlooking the bayou and downtown. The Houston Heights Orchestra group provided music. Special thanks to our neighbors who helped to pull this event together: Jan Greer, Robyn Klepper, Phil Teague, Michael Graves, Emily Trout, Teri Hagen, Meredith Burke, David Coyle, and Mark Sternfels. Thanks to those who helped the day of the event: Desiree Ruiz, Amanda Brown, Lauren Snead, Amalia Doebbert, Janie Reyes, and Andrew Burke. The event sponsors were instrumental in organizing the event: Elan Heights, Memorial Hermann Heights, Sonoma, Kagen Cellars, Cherry Pie Hospitality (Lee's Fried Chicken and Pi Pizza), Treadsack Restaurant Group (Down House, Hunky Dory, and Bernadines), Wokker TX Ranger, Red Dessert Dive, Happy Fatz, Eureka Heights Brewery, Heights Floral Shop, Heights Print Store, Wolfe’s Cleaners, and Davis Hardware. We had wonderful auction/raffle items donated by: Kagen Cellars, ABC Home and Commercial Services, Opera in the Heights, Obsidian Theater, Jack Nadel, Bayou City Smiles, Onion Creek, Good Dog, Town in City Brewery, Buchanans, NiaMoves, Orange Theory, Woodland Heights Civic Assn, Dalia Rihani, Houston Heights Orchestra, and Heights Kids Day of Music. It was a fun night with wonderful neighbors, and set the stage for Lights in the Heights. The 4th Annual Lights in the Heights Gala will be on Saturday, November 19th from 7-10pm in the game room at the new Elan Heights building. Please join your neighbors for a fun evening of games, music, and food. There will be a silent auction and raffle items from wonderful area businesses. Tickets can be purchased at the Woodland Heights Civic Association website. While Lights in the Heights 2015 was a rainy one, it did not dampen the spirits of the neighbors. Attendance was lower than last year but Woodland and Euclid were still filled with merrymakers and all the bands played their hearts out. The committee would like to express deep thanks to our Entertainment Sponsor, Memorial Hermann Greater Heights. They were gracious, easy to work with and were crucial to our success. We also had amazing Gala Sponsors, most of whom have been donating all three years. Please check out all these local businesses and show them some love! We also thank all the neighbors who contributed through our 3rd Annual Gala and all who purchased LITH2015 merchandise. I cannot say enough about the dedicated volunteers of the LITH committee. Thanks to each of you for all your hard work! Tickets are almost sold out for the 3rd Annual Lights in the Heights Gala, benefitting Lights in the Heights 2015. The Gala is November 7 at 7 p.m. at the beautiful home of Bill Baldwin on Bayland Avenue. Sponsors include delicious food from Shade, Liberty Kitchen, and Red Dessert Dive. Beer and wine from Town in City Brewing and Woodland Heights residents Emily Trout and Mark Ellenberger of Kagan Cellars. There will be music and a silent auction/raffle with wonderful items donated by neighbors and area businesses. Join us for an evening with friends and neighbors as we usher in the holiday season! Purchase tickets online from the WHCA Store.